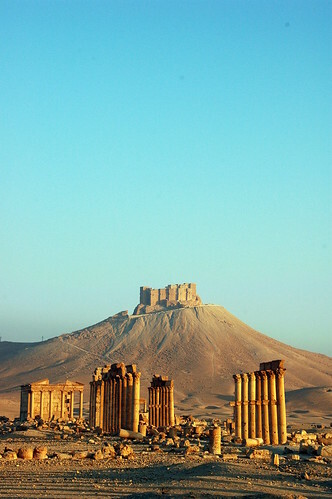 Palmyra (by loufi on flickr). Based on the previous post, I can’t help make the following observations. Let be a non-abelian finite group, and its derived group. Let be the probability that two elements of commute: , where is the number of ordered pairs such that , and is the total number of ordered pairs in . Rusin has shown that . Then the maximum value of is , and is attained for and , two groups of order 8. Moreover, when we have . Now to another world where these very numbers also appear. For any planar lattice , denote by the number of self-avoiding nearest-neighbour paths, and call the connectivity constant. Then a famous conjecture of Nienhuis is that for any lattice one has as . This rate has been proven conditionally by Lawler-Schramm-Werner. Also, these authors had previously shown the following result: let and be two independent Brownian motions with , then there exists a constant such that the probability that these two random paths do not intersect is governed by the exponent , namely one has . (Their results are vastly more general, but boil down to this for two families made by one Brownian each). So, in both cases of non-abelian finite groups and of self-avoiding random walks we have these two rather noticeable numbers 5/8 and 11/32 appearing: is there something deep going on, or is this just an accident? The following is simply a collection of results, which I haven’t checked just yet. Let be a finite non-abelian group. Let be the number of ordered pairs such that , and be the total number of ordered pairs in . So the real number belongs to . In 1979, Rusin has worked out explicitely the groups for which , in this freely available paper. The maximum value is , attained both by the quaternion group and the dihedral group . Then there is an infinite decreasing series starting at and accumulating at . And finally between and there are a handful of other cases. Some problems regarding lower bounds, or the density of the values of in intervals with are mentionned, I believe they are still open.